Bot River, a quirky, heart-shaped little dorpie a mere hour’s drive from Cape Town, has long been a haven for wine industry pioneers and mavericks, with 13 wine farms (most of them family-owned and run) producing world class wines. In addition, this underrated, unpretentious 10 km enclave is also renowned for its conservation initiatives; ‘chilled’ approach to life, and honest, hands-on winemaking methods. “Bot River ranks amongst the most exciting Winelands destinations, having defiantly maintained our own distinct, laid-back identity. 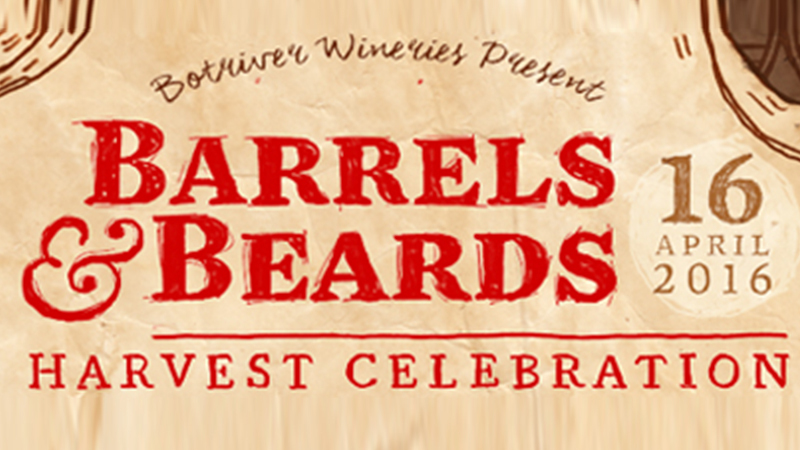 We invite everyone to come and celebrate with our winemakers as we flaunt our whiskers and wines,” adds Sebastian Beaumont, proprietor and winemaker at Beaumont Wines. Cellars to take part in the 2016 celebration include Barton Vineyards, Beaumont Wines, Gabriëlskloof, Genevieve MCC, Goedvertrouw, Luddite, Maremanna, Momento, Thorne and Daughters, Rivendell, Villion and Wildekrans. Barrels & Beards 2016 consists of three special events: kicking off with laid back get-together at Honingklip Brewery on Friday night, 15 April, easing into a not-to-be-missed Best of Bot vs International Tasting at Goedvertrouw on Saturday morning, 16 April. The weekend then culminates with the main event, The Baard Paartie on Saturday evening at Baard-ton (Barton) Vineyards at 17h00. After learning to appreciate the wide range of European beers, in particular the Belgian beers, Mark and Analize ter Morshuizen set out to brew them locally, and made their home in Bot River. After 8 years the result is Honingklp Brewery, brewing a range of Belgian inspired ales, complemented by Chef Jon Light’s cuisine featuring – among other things – homemade pork sausages. The winemakers of Bot River love nothing more than an ice cold craft beer on a Friday arve, so join them for a relaxed kuier at Honingklip from 18h00 – tickets are R180 and include beer and pork sausages. The unique ‘Best of Bot River Tasting’ at Goedvertrouw Wine Estate – owned and run by Elreda Pillman – on the Saturday morning is aimed at the more serious winos and cellar buffs. During the first part of the tasting, guests will have a chance to taste the best of the 2015 vintage hailing from Bot River. After that, Roland Peens will present a blind tasting of the finest wines from Bot River against international counterparts. At the main event at Barton Vineyards on Saturday evening, guests will be able to taste the young wines from the 2016 vintage, straight from the barrel, whilst comparing them to older vintages of the same wine. This will be followed by a delicious, proudly Botriviera dinner and of course, the long-awaited Beard competition. Wines will be on sale on the evening. A shuttle service (departing from the Botrivier Hotel) will be available on the evening in support of responsible drinking. Event sponsors include Wesgro and Amorim Cork, South Africa’s largest natural cork supplier.